For over a million years, our world has suffered from a volatile and unpredictable climate. The current ice age is showing signs of being the worst of the lot. At the tropics, although the temperatures are more consistent, the forests and grasslands keep advancing and retreating, driven by drastic changes in rainfall over thousands of years. Towards the poles it’s a different story, especially in the far north. 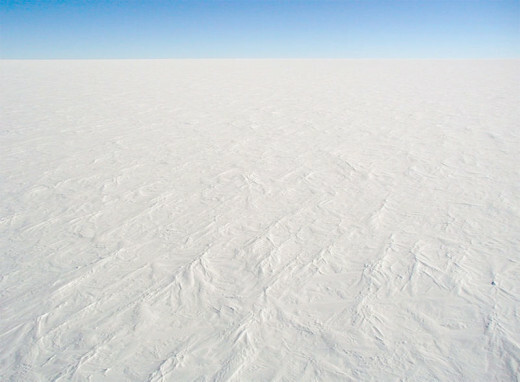 With each ice age, the great ice caps spread from their polar home, covering large areas of Eurasia and North America, grinding the landscape with their glaciers and creating vast areas of dry, cold tundra and steppe. Yet astonishingly, life has evolved to exploit this rather grim environment. Various species of grasses, sedges and trees have adapted to take full advantage of the very brief summers. Large herbivores such as bison and rhinoceros have grown thick woolly coats, and predators such as lions turn snowy white in winter to help them stalk unnoticed through the icy landscape. But one creature above all, has come to epitomise life’s incredible adaptability and refusal to abandon even the bleakest environment, the woolly mammoth. All across the northern continents, millions of these ice age giants harvest the lush grasslands that grow under the shadow of formidable glaciers. It’s an extremely tough life, but these animals are born to it. The woolly mammoth is the defining icon of the ice age, these magnificent creatures were highly successful and the dominant herbivore across virtually the entire northern hemisphere. 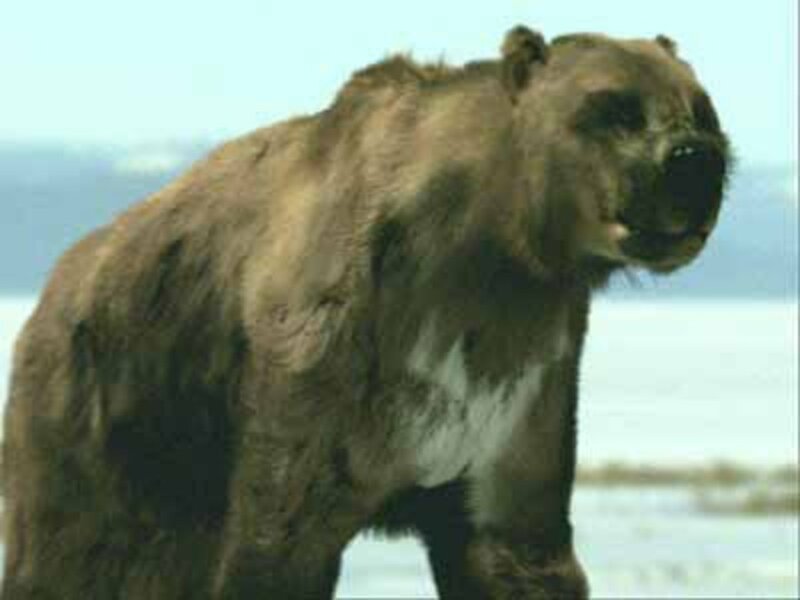 There were several types of mammoth, but the 'woolly' variety was hairier and slightly smaller than its southern cousins. Evidence: The woolly mammoth is known from bones and frozen carcasses from Ireland, across Europe and Russia, to the east coast of North America. 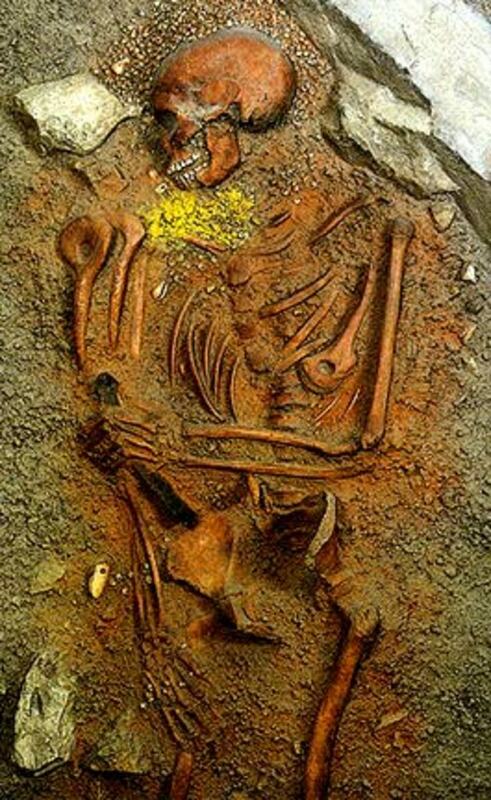 The best preserved bodies have been found in Siberia. Size: Males: 10 feet tall. Females 9 feet tall. Diet: Grasses and sedges with some browsed twigs. The anatomically modern human skeletons first appeared in Europe around 40,000 years ago, having spread from the Middle East and North Africa. We have the remains of huts which they built , their spectacular carvings and paintings, and even jewellery. The carvings include human figures showing people wearing woven clothing, and there are also ritual burials where the body is covered in ivory beads, which seem to have been sewn on to cloth which has since disintegrated. Evidence: Modern humans spread relatively rapidly across southern Europe from the Middle East, and left camp-sites and tools as well as bones. Size: Males: 6 feet. Females: 5 feet, 6 inches. Diet: Humans were very adaptable in what they ate. Certainly they ate fruit and vegetables as well as meat, but each camp-site seems to show different favourite prey animals. Rabbits and hares were among the most popular. In one camp in Italy, though, it seems that humans specialised in hunting tortoises. Time: About 200,000 years ago to the present day. A low summer sun throws up shadows across the rolling hills of the steppe. It’s a warm evening and the air is thick with undulating swarms of midges. Underfoot the vegetation is lush with sedges, club moss and dwarf trees all scrambling for room among dense swathes of grass. Here and there, the open steppe is interrupted by clumps of trees such as larch and alder, which grow in the valleys. In between them, large herds of bison, horse and caribou congregate and graze together. One day, this whole area will be flooded by the North Sea, but now 30,000 years before our time, it’s a rich summer pasture. However, this apparently benign landscape hides its true nature in summer colours. Just a hundred miles to the north, lies a gigantic ice sheet and, in a few weeks, temperatures here will begin to plummet with the approach of a long ice age winter. Only the hardiest plants can survive this. Not only do they have to remain dormant and frozen, during the winter, but even during the short summer, there is very little rain, making growth very difficult indeed. Many of the animals that inhabit the steppe are not permanent residents; instead they visit simply to enjoy the short lived summer bounty while they can. Following the vast herds every year are a menagerie of predators and scavengers. 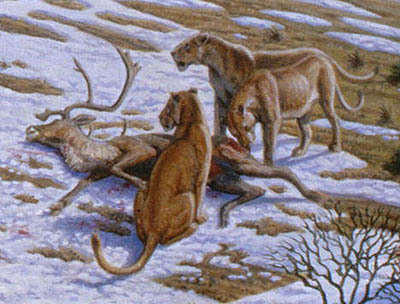 Beneath a long, low ridge, a group of one such animal, humans are picking over a caribou carcass brought down and abandoned by a pack of wolves. In the twilight, their distinctive, almost constant, guttural chatter drifts across the valley, as they concentrate on stripping the carcass as quickly as they can. 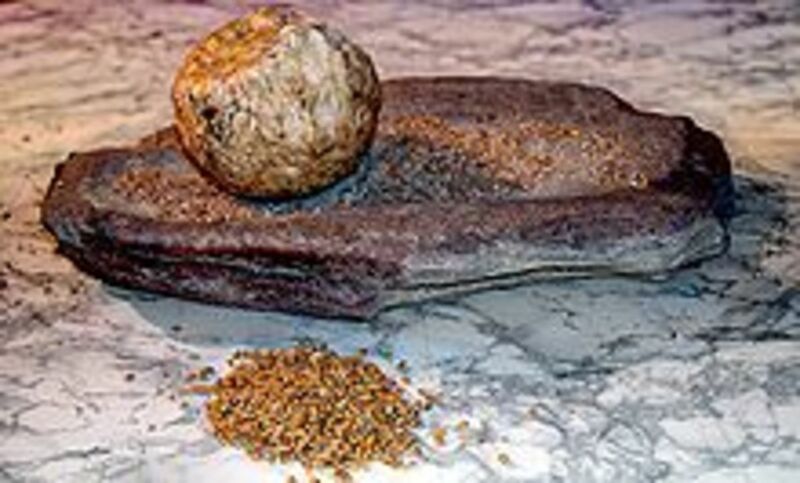 The humans’ unique ability to use stone tools, developed from their ancient African ancestors allows them to make the most of any resource available to them. In fact, they are so absorbed in their task, that they fail to spot the fast approaching danger. Rising up over the ridge comes the unmistakably familiar bulk of a female woolly mammoth, her dense summer coat illuminated by the fast failing ice age sun. She is the matriarch of a herd of eight younger animals. Upon spotting the humans, she raises her huge twisted tusks in a classic threat display and walks confidently straight towards them. For a brief moment the humans weigh up the situation, contemplating whether or not they should try to drag the carcass with them, but the caribou is far too heavy and on these open steppes, even humans eventually give way to the mighty mammoths. The humans scatter, as the matriarch makes it clear that she will not tolerate them anywhere near the herd. Humans do occasionally threaten mammoth herds, but the real reason for her concern becomes apparent, as the rest of the herd appears over the hill. Ambling beneath his mother’s shaggy flanks is a small calf; he is extremely vulnerable to the sophisticated hunting techniques often employed by humans. This evening though, the humans decide they have enough meat and, in the gathering gloom, they melt away into the landscape. The herds moves past the carcass silently and quickly resume the important activity of feeding. During the summer, mammoths will sometimes feed all day and most of the night. 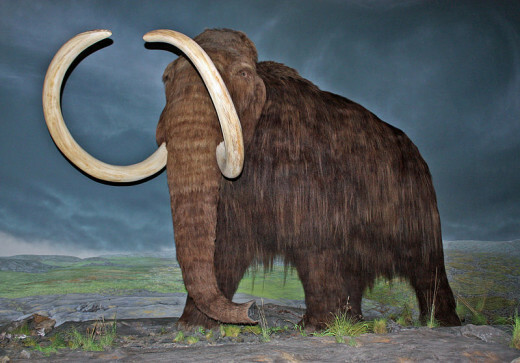 A fully grown woolly mammoth weighs around 7 tons and needs around 400 pounds of food a day to remain nourished. Woolly mammoth’s will eat just about any plant, including the leaves and bark of trees, grass though, tends to make up the majority of its diet. 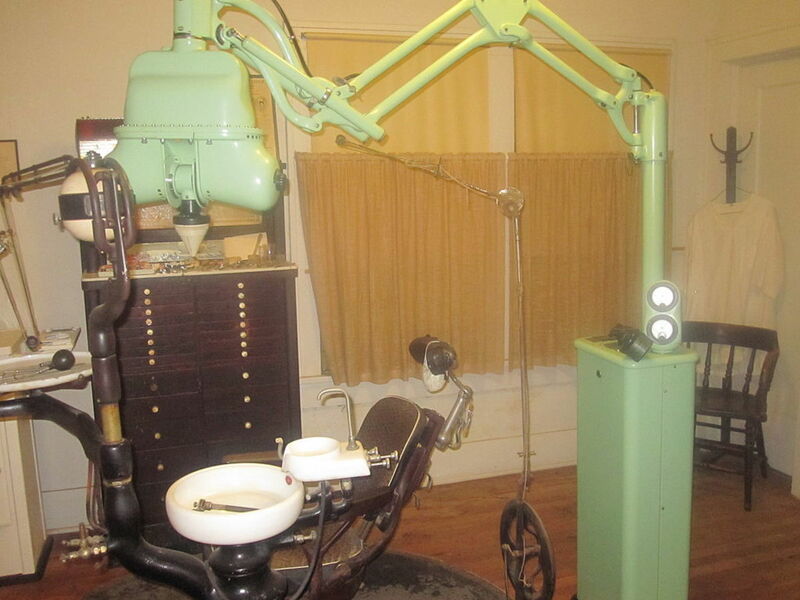 Watching a mammoth at work is bearing witness to a true specialist. The tip of its trunk can either pluck individual tasty morsels such as flowers or wrap round and rip up huge clumps of grass. The trunk then feeds a mouth containing gigantic grinding molars that smash up the toughest steppe vegetation and sends it on down to the mammoth’s fermentation vat of a stomach. As the herd concentrates on their grazing, only the youngster seems disinterested. He still gets most of his nutrition from his mother’s milk, and so has more time on his hands to play, but also, to get into trouble. At the bottom of the valley is a small lake surrounded by particularly lush vegetation. Gradually the herd shift closer to the lake’s swampy shores as they continue grazing. Suddenly the calf, who has been wandering ahead of his mother, slips into deep mud. He trumpets in alarms, as his small limbs soon become trapped in the thick cold silt. Within a matter of seconds, his mother, aunt and elder cousin are on the scene to help him. As they struggle to dig him out, they too sink into the mud. But it only comes up to their knees and soon a very dirty and chastened mammoth is returned to his mother. The herd are a very close knit group, which is not surprising since they are all related. The matriarch is about 40 years old and is accompanied by her 30 year old sister (the mother of the male calf). The herd also contains the matriarch’s three daughters, two of them are mature females, while the other is only four years old. Other than the calf, the only other male in the herd is a young adolescent. Soon, he will leave the herd forever and, like all bulls will lead a solitary life seeking out receptive females in other herds. As night progresses, a cold wind arrives from the north. There are still several weeks of summer left, but the icy breeze is a reminder of the bitterness and hardship that is to come. In the distance, the fires of a group of humans are visible against the jet black landscape and the smell of burning mammoth bones drifts silently through the air. The shriek of a horse being attacked by hyenas disturbs the otherwise silent night; the mammoths’ though, remain unconcerned, they are far too big, to feel threatened by a hyenas', so they carry on calmly feeding. Megaloceros is often called the 'Irish elk,' although it was found all across Europe and is technically a deer rather than an elk. A bizarre early theory was that its huge antlers were its downfall, because they grew so large that the animals could not lift their heads. It is now thought there must have been a significant sexual advantage for males with large antlers, hence some grew to over 10 feet across. Evidence: Megaloceros fossils are found in large numbers, especially in the peat bogs of Ireland. Most of them are males suffering from malnutrition, presumably from the autumn rutting season. 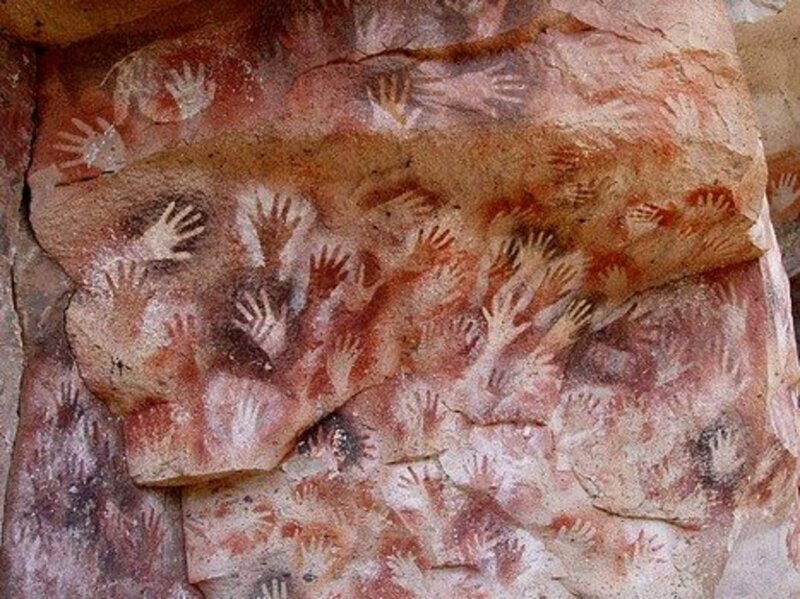 They are also seen in cave paintings, which indicates their colour patterns. Size: 6 feet 6 inches at the shoulder. Diet: Grass and browsed vegetation from the edges of woodlands. Time: 400,000 -9500 years ago. September marks the start of the rutting season for the giant deer known as Megaloceros, and already the weather has turned bitterly cold. Overnight the first fall of powdery snow has filled the valley gullies and will not melt for another five months. The grasses have turned brown and the dwarf birches have shed their leaves. In barely a month since we left the mammoth herd, the landscape has transformed. Many of the summer visitors have left and herds of bison and caribou have been on the move all day. Soon, the mammoth herds will join them, but for now they are still scraping the last out of their summer grazing grounds. The matriarch uses her curved tusks to sweep away a patch of the light snow and starts tearing up thick wads of moss. Since August the mammoth’s appearance has altered somewhat with the growth of their winter coat. It’s longer and darker, giving them their distinctive chocolate brown colour and also their characteristic ’skirt’ of guard hairs. As the cold wind catches and blows it around, their soft pale under-wool becomes visible. On a barren hillside nearby a harem of Megaloceros hinds wait for two gigantic stags to sort out who will mate with them. Both of them, are in their prime and, as they issue their series of bellowing challenges, clouds of vapour drift up past their enormous antlers. Slowly they size each other up while they advance higher and higher up the side of the hill. Each stag is trying to gain an advantage over the other, but they are of the same size and age, with matching 10 feet wide antlers. Neither one is going to give way without a fight. As they approach the ridge one male rears up and brings his antlers crashing down for a second. His opponent is ready for this and makes sure their antlers lock and match. The posturing and displaying has now transformed into a fearsome trial of strength. The pair wheel around again and again, as each animal tries to use the slope to give themselves an advantage. Their grunts and the sound of clattering antlers echo around the valley. Unfortunately for them, the mammoths are the only witness to this grand sexual contest. But not too far away, in a dense stand of larch a group of humans watch the fight with all the interest and intensity of a top predator. Eventually the males break with a clear winner and the exhausted loser fleeing from the scene. It just so happens, that he was the incumbent male and had probably already had to fight three or four times before this season to defend his harem. Now finally defeated, he stands breathing heavily by the stand of larch. His body is covered in cuts and the signs of exhaustion are plain for all to see. For the humans hiding nearby, this is the moment they've been waiting for. 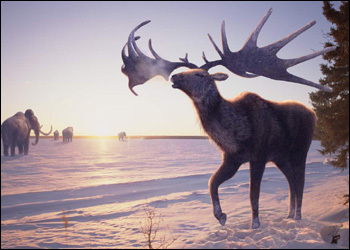 With their massive antlers and standing over 6.5 feet at the shoulder, a mature Megaloceros has little to fear from a human. But at this time of year, things are different. Food is scarce and, like all the other creatures, the humans need to feed up before moving south. Crucially, the rut has a devastating effect on the strength of Megaloceros’ stags, making them easier prey than normal. 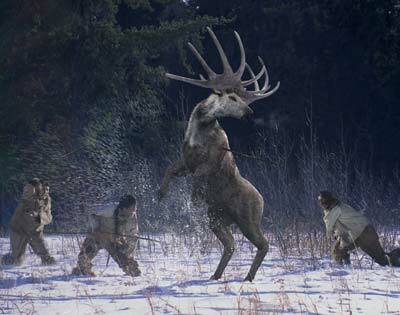 Three humans covered in animal skins and brandishing spears approach the defeated male from the open and attempt to drive him back towards the larch. He stops short of the trees and prepares to charge, but the humans foil his best defence by throwing stones to keep the mighty beast at bay. Then a spear seems to appear from nowhere, cutting the Megaloceros’ shoulder. He moves along the clump of larch, but as he does so another human materialises out of the trees. Panicked, the big male swivels round, and attempts to run further into the wood, but his giant antlers soon get tangled in the branches. The humans, sensing victory rush him. The fight is all but lost, but the big stag does manage to catch one of the hunters with his antlers. The humans use their spears ruthlessly, initially incapacitating the male and then delivering the killer blow. Throughout the morning, the wind has been gradually growing stronger and, as the humans huddle round their kill, the mammoth matriarch decides that now is the time to leave. With a weather system moving towards the east, even colder temperatures are being dragged down from the north, this is the matriarch’s cue to head south. Mammoths are not truly migratory like the caribou, but even they cannot remain on these exposed plains during the bitter ice age winter. To the south lies more sheltered valleys, which will provide the perfect winter home for them. As the herd start moving off, a pack of wolves appear to the south. They have picked up the scent of the Megaloceros kill and hope to scavenge their share. Lions have been around in Africa for at least 3.5 million years, but they first appeared in Europe 900,000 years ago, and since that time became reasonably common. The European lions are slightly larger than their African cousins, which probably helped them hunt some of the larger herbivores on the European plains, such as bison. Cave paintings of European lions suggest that they had no mane or tuft at the end of the tail, although the paintings could be of female lions. Evidence: Common in Europe, with especially large numbers being found at Geilenreuth in Germany and Wierzchoedkiej Gornej in Poland. Size: About 5 feet in the shoulder. Diet: Horses, deer and bison. The open steppes are now completely deserted, the mammoth bone huts erected by the humans are abandoned and the only visible animals are the few musk oxen scraping for moss beneath the snow. The great mammoth herds are drifting south, each led by a matriarch who can remember the route. Our mammoth herd are well on their way, their matriarch has made this journey more than 40 times already, and knows which valleys are best to winter in. One of the younger females is pregnant, and since mammoth pregnancies last for two years, this is the third time she has had to travel while carrying. However, her trial will not be as bad as that of the youngster. He was born only in the late spring and this is the first time he has had to move so far or face such consistently low temperatures. His mother sticks to him like glue, but their pace is much slower than the others and they frequently fall behind. After several kilometres a heavy blizzard blows in from the west and the mother has to stop and shelter her baby. By the time it clears they have become totally separated from the herd. She calls out, but the rest are too far ahead, so its now up to her alone to lead the calf to safety. The mother calls again and this time she gets a response; but not, unfortunately, from a mammoth. As the blizzard recedes, the mother spots movement through the last flurries of snow. A predator has appeared on a ridge ahead. The mother can’t make out the predator by sight, but she can definitely smell it, it’s a lion. He is the most powerful predator here and much larger than his African counterparts. With fur covered feet and a pale coat, the lion moves like a ghost over the snowy hills. He shadows the two mammoths, looking for a chance to grab the baby. At one point he stalks too close and the mother instantly attacks. The lion instantly backs off, despite his size and power, he will not dare attack unless the calf is separated from his gigantic mother. The mother stops calling and moves off warily. Ahead the herd have other concerns. The adolescent male has fallen through some ice and has become trapped in the freezing cold water. The rest of the herd have gathered round, but are powerless to help without running the risk of suffering the same fate. Beneath the thin blanket of snow this countryside is full of ponds, lakes and streams that quickly freeze over in the winter. Many though, cannot support the weight of a full grown mammoth and this miserable fate is all too common amongst these gentle giants. The young male is submerged up to his shoulders and the mixture of smashed ice, water and mud around him offers no chance to clamber out. His woolly coat is sodden, adding to his weight and his troubles. The matriarch reaches out with a trunk, apparently to reassure him, as there’s little chance of pulling him out. The scene is witnessed by a group of humans, but they know that scavenging the dead mammoth would be perilous. Moreover, they cannot afford to linger in such an exposed position, so they move on. The rest of the herd may well stand by the corpse for several days, protecting it. But as each one moves on, the young male’s life slowly ebbs away. This delay means that the mother and calf unwittingly overtake the rest of their herd. As they approach the southern uplands and valleys, the changing geography forces many animals to migrate together. This is perhaps the only time of year, where one can truly appreciate the wealth of life that feeds and relies on the steppes in one way or another. The mother and baby join the procession, with so many giant mammoths around, the little calf should be safe from lion attack. Besides, it would seem that the predator has found other prey. In the woods overlooking the escarpment, the lion watches the mammoths, its snowy white coat spattered with red. He stands over a bundle of fur which contains a human, a much easier prey item for a predator of his size. 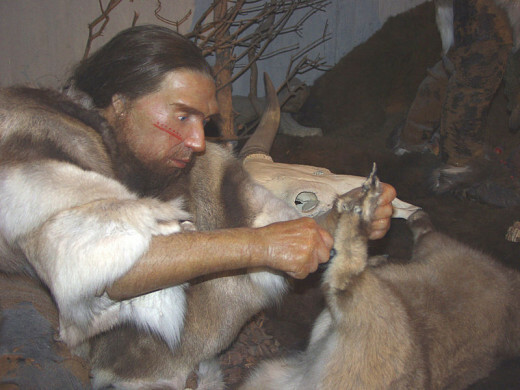 The first Neanderthal remains were found in the Neander valley in Germany in 1856. Nearly ten years later, a detailed study of the bones revealed that they were different from those of modern humans, and they were given the species name Homo neanderthalensis. 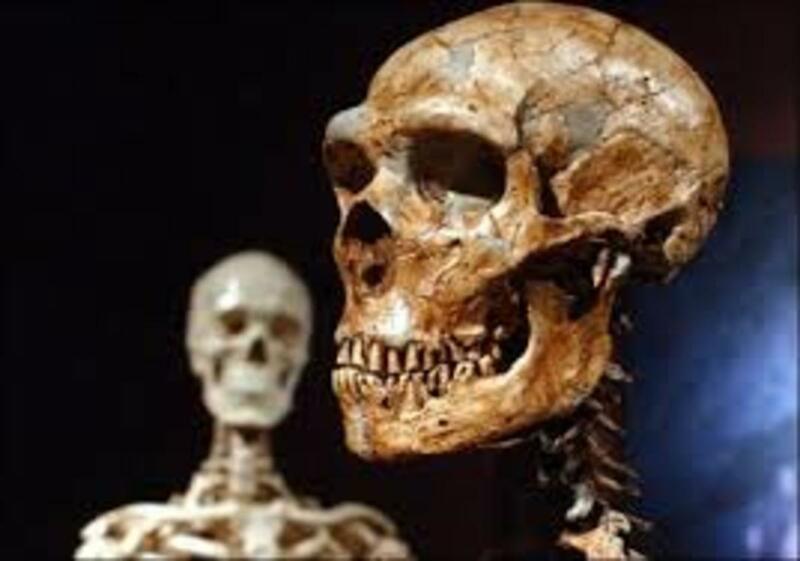 Evidence: Neanderthal remains have been found in a broad band from the Middle East, the Mediterranean and Britain. These include bones, camp-sites and tools, but as far as we know there are no artistic representations of them. Size: Males: 5 feet, 6 inches. Females: 5 feet, 3 inches. The horns of the woolly rhino were often found in Russia during the 19th century, but because they are so strange looking, many people believed that they were the remains of giant birds. 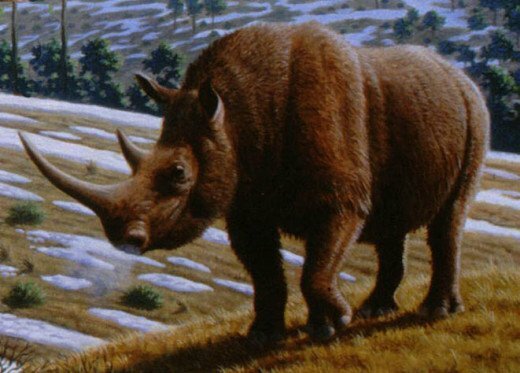 Frozen carcasses of woolly rhinos were occasionally found in Siberia, although often without their horns or hair, but eventually it was realised that the two belonged together. Evidence: Rhino remains have been found all across Europe, with the best preserved carcasses in Siberia. Apparently they failed to make it to both North America and Ireland. 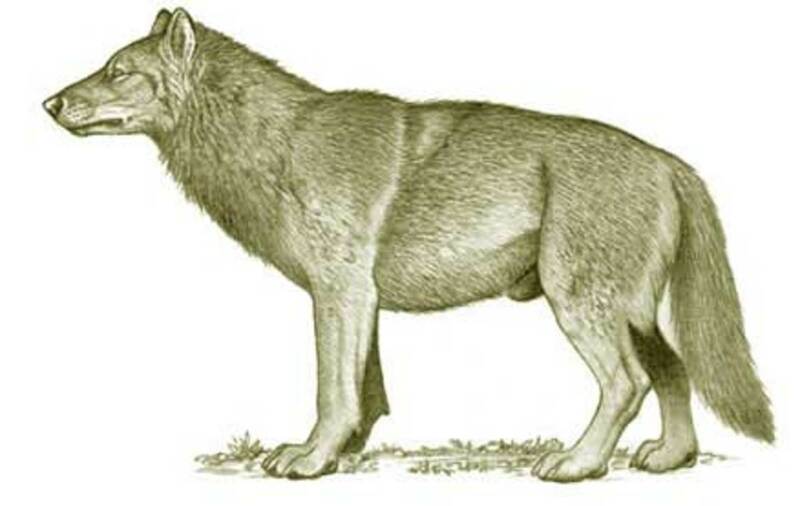 They are depicted in cave paintings, which suggests that they had a dark band of fur around their middles. Size: 7 feet at the shoulder. The mammoth caravan has now moved into the more rugged country that lies to the south of the steppe, it’s here that the vegetation changes dramatically. There are more forests of birch, alder and willow, giving the animals that live here more shelter and a wider range of food. 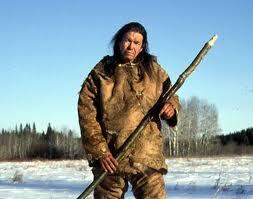 This suits one creature that is of particular interest to us, another species of human, the Neanderthals. They’re much better adapted to the cold and stay in the same valleys all year round. They live in small groups, and like the other humans use furs to protect themselves from the cold. They are much shorter and stockier than their cousins. But despite the fact that they are specifically adapted for such extreme conditions, their population is in serious decline, in fact they are now an endangered species, surviving in small pockets only. In fact humans, as a group are in decline generally and are not as varied as they once were; the Neanderthals and their cousins may be the only two species left. Every winter the mammoths come off the steppe and disperse into these valleys, surviving on a diet of bark, evergreen twigs and what grass and herbs they can find amongst the snow. Generally they stick to the more open areas since they are not animals suited to life in the forest. In one such valley the matriarch arrives with her herd. It has been a hard journey, she’s lost a nephew and her sister and her youngest nephew are still missing. The herd stops near a cliff that contains Neanderthal caves. The matriarch fells a willow tree, so that they can eat the few leaves that still cling to the upper branches. Smoke from the Neanderthals’ fires curl up in front of the cave as the humans watch the mammoths warily, these are rather dangerous neighbours. One member of the Neanderthal group has been away collecting precious firewood and on his return is forced to take a detour to avoid crossing the herds path. However, this brings him face to face with an even more unpredictable foe. On clearing a group of alder to the left of the herd, he stumbles awkwardly into a clearing already occupied by a woolly rhino. Like the lions these northern rhinos are slightly larger than their African cousins. They have a thick winter coat and extraordinarily long horns, sometimes up to 7 feet long. Most of the time, these are used for clearing snow, but they also double as formidable weapons. To make matters worse, like all rhinos, woollies are shortsighted and notoriously bad tempered. The rhino smells the Neanderthal immediately and snorts aggressively. The human stops and starts very slowly to retrace his steps. He knows all to well, how dangerous a rhino can be, since both animals stay in the same place all year round. But this means that the rhino knows the scent of the Neanderthal and recognises him as a carnivore. The Neanderthal approaches the trees, then turns to run for his caves. The rhino sees this movement and, probably thinking that he is under attack, charges fast towards the Neanderthal. The rhino is fleet of foot, while the human's progress is hindered by his furs. Before he can reach the denser trees the rhino catches him with a glancing blow with his horn, sending him reeling against a birch stump. The whole episode barely takes a second and, after the Neanderthal has lain motionless for a few moments, the rhino snorts and wanders off. However, the rhino weighs well over two tons, while the Neanderthal weighs around 150 pounds. The blow has shattered his hip and leg. With a whole winter ahead of him, he will survive only if his group manage to help him through. Even so, his hunting days are certainly over. 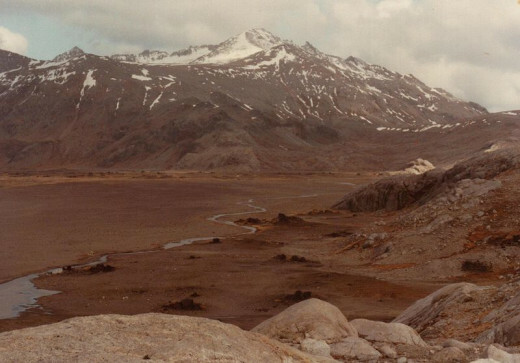 Later that day, the mammoths move away from the caves and spend the night near a large lake that has yet to freeze. The next morning a mist hangs over the water, but the day is still and bright. The herd’s casual feeding and drinking is transformed by a low call and a series of short, high pitched honks. Around the far shore come the missing mother with the male calf to rejoin the herd. The same unfailing memory that the matriarch uses to lead the herd every year has served her sister well and thus has greatly improved the chances of her little one surviving the winter. They greet with the usual grappling of trunks and clattering of tusks. For the mammoth herd, the journey has now ended, and with the loss of only one member, it wasn't that bad. Thanks very much for your kind words and for your visit, Eddy. You take care and enjoy your day too. Interesting;well informed and actually a brilliant read all round. Hi Georgie, personally I pronounce it Neander Tall, but I don't think it matters to be honest. Hehehehe! Living with Bigfoot :) Is that why you say you're from Sasquatch Country hehehe :) Thanks for popping by Georgie, appreciate it. I love reading your Hubs. They're always well written and informative. I really liked the informational sidebars, too. The Megaloceros almost sounds like it should have been a giant rhino! Is Neanderthal pronounced Neander Thall or Neander Tall? I've heard it both ways. Cheers Jools, it means a lot, as it took me a long time to put together. Really glad you picked up on the documentary element, because that's what was trying to do, rather than just write a normal informational hub. Thanks for popping by. Wow James, this is an epic hub. Well researched and the formatting is great. Loads of info about the Mammoths journey and other animals as well. It reads like a documentary; in fact it is almost storytelling. I really enjoyed the style of it. Well done.